Sustainability is an ongoing pressing concern for our readers and our clients’ readers. Instead of focusing on green rated products and practical tips, FLOORS in Africa magazine interviewed Grahame Cruickshanks, Managing Executive: Market Engagement, at the Green Building Council of South Africa (GBSA) to find out more about where South African property developers and tenants are as regards green building, the general attitude towards sustainability, and what progress is being made in our country. There has been a significant increase in the rate of project certifications at the GBCSA. Grahame says their recent figures send a strong message to the public sector about the accessibility of certification and show that the desire for GBCSA-certified projects is at an all-time high. “By October 2018, 400 Green Star Rated projects had been certified by the GBCSA. In October 2017, 300 projects had been certified, so it took us a year to go from 300 to 400 certified projects. When the GBCSA was founded in 2008, it took us six years to announce the 100th Green Star Rated project in South Africa in 2013,” says Grahame. Grahame explains that Net Zero/Net Positive is a methodology that can accelerate the GBCSA’s end goal of complete market transformation and is about inspiring the end goal now. “The GBCSA wants to lead market transformation with the Net Zero/Net Positive Rating tool. With this new certification, we are shifting the conversation from ‘doing less bad’ with building to ‘doing good’. But how can you have zero impact on the natural environment and, in some cases, even take it a step further and put water and electricity back into the community? The South African market has matured from talking about their activities that are leading to less waste in landfills and energy consumed, to how they can create buildings that are truly sustainable, that even have a positive impact on the environment,” says Grahame. The GBCSA realises that not many projects will have net zero or net positive ambitions as a formal certification path in the first few years of being established. However, it is about industry leaders setting the example through projects that will inspire others to do the same, and will influence the market to change. These leading projects also become pioneers in design and technology advancement that others will look to for ideas and knowledge creation, to find practical solutions to what until then seemed insurmountable challenges. A project that has achieved a Net Zero Rating by the GBCSA is 78 Corlett Drive in Johannesburg. The project, developed by Legaro Properties with Solid Green Consulting as green building specialists, was awarded a Net Zero Carbon (Pilot) Level 1 Certification in late November 2017, and a 6-star Green Star Office V1.1 Design certification in January 2018. 78 Corlett Drive is a brownfields site situated a stone’s throw from Melrose Arch. The brief from the client was to set a new standard of vibrant and trendy co-working office space in a contemporary new development. The cellular offices and co-working spaces on the upper ground floor of the building are interspersed with social and formal meeting spaces organised around a central coffee bar in a triple volume day-lit atrium. The design incorporates strong minimalist geometrics, with shading louvres acting as a dynamic façade element and passive shading device. “Energy strategies for contributing to the Net Zero Carbon Level 1 Certification included generating an energy model of the building in the design stages, comparing 78 Corlett to a notional building model,” says Marloes Reinink, Founder of Solid Green. A photovoltaic array installation on the roof has an annual output of 92 000 kWh and will tie into the grid to actively reduce the building’s peak electrical demand. The building also saves energy with individually switched lighting spaces that achieve an average maintained illuminance level of no more than 400 Lux. “Separate energy sub-meters are provided for lighting and power to accurately monitor energy consumption. The behaviour of occupants and users of the building is critical to reducing consumption, and the owners are targeting an overall consumption of 75kWh/m²/year, far less than the 200kWh/m²/year SANS10400 XA requirement,” adds Marloes. Small high performance electric under-counter geysers have been installed in each bathroom to alleviate the need for long runs of insulated hot water pipes, and the geyser’s electric requirements are supplemented by the PV array on the roof. Separate energy sub-meters have been provided for lighting and power to accurately monitor energy consumption. Sub-metering of major water systems is in position, and low flow fittings have been specified throughout. A project specific Waste Management Plan has been developed to minimise waste to landfill during construction and operations. “Setting ambitious targets for more sustainable construction practices and operations throughout a building’s lifecycle can help create a project that will have the least amount of impact, or even a positive impact, on the environment. We recommend working with experienced green building consultants to achieve this worthy rating,” says Marloes. Grahame adds that green building is now financially achievable with minimal cost implications. “In 2019, architects and specifiers will find that the conversations they have with clients are no longer whether they should go green but rather around which certification they should target and which green products they should use. The GBCSA’s own offices were recently certified using our Interior Rating Tools. 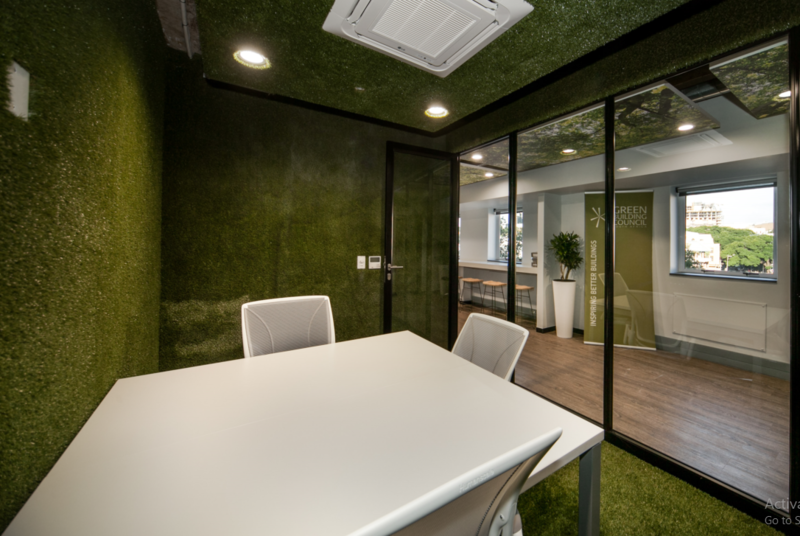 We specified a Belgotex grass product to cover our interior space’s bulkheads, which is a unique way to use a flooring product in a creative and different type of installation. We also specified Shaw Carpeting’s carpets for the general office and main boardroom area. Flooring products have a large role to play in contributing to the sustainability of a project,” says Grahame. Pavegen, in collaboration with Masdar (Abu Dhabi Future Energy Company), are constructing a 16m² energy harvesting walkway at the Abu Dhabi International Airport. The interactive walkway converts the footsteps of travellers into off-grid electricity and data. The pathway connects two terminals at the high-tech airport and the footsteps of approximately 8000 travellers per day will be captured and converted into energy, to not only track footfall data but convert the energy to power the lighting along the walkway. The sustainable walkway system is complemented by screens that highlight how much energy is being harvested. There is also a game for children, showing airplanes taking off and descending according to how much energy is being generated. A series of interlocking triangles are used to construct the articulated flooring, which is Pavegen’s patented system. When people move across the floor, electromagnetic generators produce off-grid energy to power local LED lighting and provide a data feed. “The hope is that through this installation, both UAE tourists and residents will see and feel first-hand the role they can play in our larger sustainability journey,” Youself Ahmed Baselaid, Executive Director of Sustainable Real Estate at Masdar, told Constructionweekonline.com. *Note: all statistics are approximations based on average consumption and emission patterns. Specialised tip: In 2019, architects and specifiers will find that the conversations they have with clients are no longer whether they should go green but rather around which certification they should target and which green products they should use. Full thanks and acknowledgement are given to www.gbcsa.co.za, www.solidgreen.co.za and www.constructionweekonline.com for some of the information provided to write this article.